A Shot in the Dark: My debut novel is almost here! My debut novel is almost here! So I haven't written a blog in a while, but with only 9 days to go until Divinely Entwined is released, I felt the need to write one! 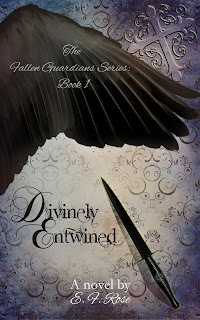 First, I have to say that I can't believe Divinely Entwined is almost ready to be published. I mean it's crazy! Right? To say this has been a roller-coaster of a journey would definitely be putting it lightly, but I've loved every second of it. You see, for as long as I can remember I have wanted to write. Back in high school I would write poems all the time, some better than others (lol), but those poems I wrote were for me. I had never planned on sharing them, so it was okay if they didn't make sense to anyone but me. After awhile I decided to let others read some of my work, and their response was mind blowing. The positive reception of my poems not only surprised me in it's intensity, but in the overwhelming feel of satisfaction that grew in me because of it. My writing has always made me happy...but this, this took everything to a whole new level...and I liked it! I began to crave that level of satisfaction...hell, I was addicted to it. It was then that I realized I was no longer just writing for myself anymore, but for my family, friends, and anyone else who showed interest in my work. My goal to become a published author was planted and I told anyone who would listen about my hopes of having a book on the shelves of our local bookstore. I wanted this so bad I could taste it. That was when my character, Christian, first took a breath of life through my mind. He has changed drastically over the years since I first put pen to paper, and gave a name to the character that would forever demand his place in my stories. He's been a detective, a vampire, a warlock, and a marine...he's been emotionally damaged, aggressively protective, and irritatingly complicated. He's been all of these and more, until finally becoming the fallen angel that he is today. My dreams of publishing my work became a reality right around the same time that my first chapter of Divinely Entwined was written. Echoes, a collection of my poems, was published on August 22, 2013. It will always be special to me because it represents my past, my growth, my desire to continue striving for my dream - even when it looked out of reach. I worked hard to get my poems published and couldn't be happier about the way it turned out. Sure it may not have been a major seller or NY Times hit, but it was mine and that was all I wanted. At first! But as the 5 star reviews for it started rolling in, and several people reached out to me with praise for my work, I knew I wanted more. I wanted to share the various stories that I had running through my mind, the many ideas placed around my house on sticky notes. Divinely Entwined is that next level for me. ******Also, my friend Ashley is hosting a Release Day Blitz for me and has created a form for anyone who wants to help spread the word of my novel!